HEY, LOOK, I’ve decided, on a whim, to start yet another new feature on this blog. My God, how do I manage to keep so many different topics and themes up and running simultaneously? Believe me, pal, it’s like spinning plates while juggling chainsaws, a career and motherhood. Anyway, I could, with very little difficulty, write an entire blog not just on thrift stores, not just local thrift stores, but on local Goodwill thrift stores. But then, I’d have even less traffic to this blog (if that’s even possible) so I’ve opted not to. Or maybe…maybe I’d have many, many more visitors. Aaah, then they’d all be thrift store people and they annoy me enough as it is in the stores. Christ almighty, I don’t need them visiting my blog, too. Now here’s the thing about Goodwill Industries: As you know they operate an enormous chain of thrift stores that raise money for charity – feral cats or something, I think. But ultimately, it’s still a bunch of stores run by a big corporation. Big corporations don’t bother me (being part of the 1% and all) and I love capitalism, but I do have a problem with dumb decisions. Goodwill has made a point over the last few years, as the economy’s been tanking, to promote the idea that shopping in one of their retail locations is a sensible and frugal alternative to buying – brand new – everything from a severely dented metal IKEA side table to a Hilditch & Key dress shirt with an indelible stain that’s somehow completely invisible under fluorescent thrift store lights to personalized coffee mugs featuring photos of complete strangers’ ugly children. Buy it used at Goodwill and save-save-save, they say. Yeah, well, someone needs to tell the people who price the donated items that. 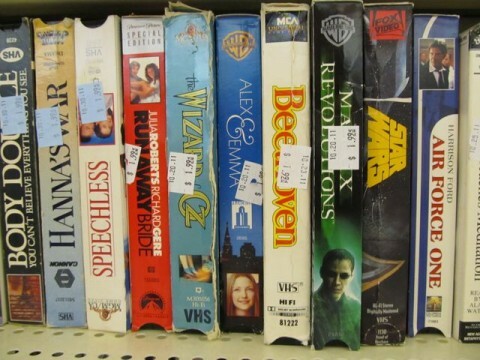 So in the highly unlikely chance that anyone from Goodwill Headquarters is reading this, here’s a newsflash, friend: VHS is a dead technology. No major studio is releasing anything on VHS anymore because we’ve all moved onto DVD and Blu-ray. 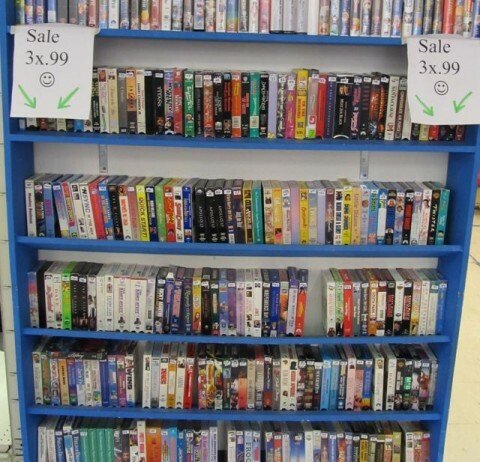 And while you can still find one or two DVD/VCR combos for sale at major electronic stores, the last standalone VCR was manufactured in 2008. Furthermore, it’s unlikely most pre-recorded VHS tapes are ever going to have any kind of serious collector value in the future. The tapes naturally degrade over the years, and even at its best, the quality is lousy compared to everything that’s come since. Plus the whole process of inserting the media into the player, and the fast forwarding, pausing, rewinding – it’s interminable compared to DVD or Blu-ray. Oh, sure, there will always be collectors who’ll want to own every single different videotape release of Star Wars likely for the sleeves alone, like idiots, and then you’ve got your jackass hipsters who might have some ridiculous 80s-themed party where part of the supposed ironic fun is watching Sixteen Candles on an old VCR while sipping old store stock drink boxes of Hi-C Ecto-Cooler spiked with vodka, and maybe I wouldn’t have called the police about the noise if I had been invited since I live right next door, but to you and me and 95% of the population, these tapes are worthless. But apparently not at Goodwill, brother! Not at Goodwill! No, here they’ll each run you a buck ninety-nine! No. The point is that no one buys them! The tapes just sit there and each week there’s more! These things multiply nearly as fast as most of the people who shop there! 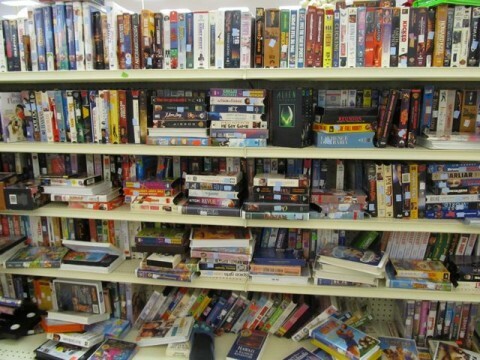 All these VHS tapes are taking up valuable thrift store shelf real estate that could better be utilized displaying donations that shoppers (i.e., me) would buy. 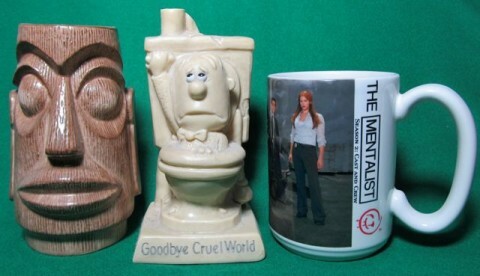 Namely vintage tiki mugs, Sillsculpts, and any sort of cast and crew item from the production of a popular TV show or film that I can turn around on eBay for twenty times its (already high) Goodwill price. Posted by Ted on November 22, 2011, 6:00 AM.